Mass shootings and Active Shooter incidents have seen a steep rise in the US and across the world in recent years. To many people this is one of the most terrifying situations to imagine and prepare for. Most modern mass shootings seem to have an element of randomness and primal rage rolled into them which only serves to heighten anxiety. What can an average person do if they were in church, at work, and a shopping center or elsewhere when bullets suddenly started flying? What is an Mass Shooting? Given the massive increase in these incidents, it is something we should all think about and prepare to survive. I encourage everyone to sit down and have a serious think about what you would do if you were in an area that was under siege by an active shooter bent on doing the most damage possible. Would you run? Would you fight back? Would you barricade yourself in a “safe” place and wait for help? To help answer these questions I reached out to Robert Richardson, an experienced prepper and author who has written about this topic on multiple occasions on his site Off Grid Survival. Robert was very helpful and gave us some practical strategies and tips for maximizing the odds of survival should you ever find yourself under attack from an active shooter. What can a person do to prepare themselves for the possibility of being involved in a mass shooting? The number one thing a person can do is realize that the danger is real; this alone already puts you ten steps ahead of the rest of the public, because at the very least you will start to become a little bit more aware of your surroundings and the possible dangers that exist. Modern day shootings seem to have an element of randomness, what can a person do to reduce their chances of getting caught in the crossfire? While this might be true in some cases, if you look at a vast majority of these shootings many of them have a couple things in common. First, a vast majority of these shootings happen in what are known as gun-free zones. For me, I try not to frequent any establishment or area that limits my ability to defend myself. Most of these mass shooters want a large body count and they want easy victims; that’s the reason most of them target gun-free zones. They know they will meet little resistance. Second, they tend to target events that will get the most media attention; large public events, grand openings, and opening night premiers are all higher-risk situations. I’m not saying you should live your life in fear, but you should be more alert in these types of situations. If a shooting occurs what is the first thing a person should do? The first thing you should do actually begins before the shooting ever takes place. Whenever I enter a new place, I make sure I know exactly where my exit points are; that way should something happen, I know right where to head once the danger strikes. And for those that think this is being overly paranoid, remember this one strategy can save you not only during mass shootings but also during threats like earthquakes or fires. You should always have an exit strategy. When should a person run vs fight back? You always want to make escape your number one priority; fighting back is a last resort option, but an option you must be prepared for. Remember this isn’t the movies; all it takes is one bullet to end your life so escape is always the best option. Should a person who decides to move to safety run as soon as the bullets start flying or hunker down and wait for an opportunity? It really depends; it’s something that you’re going to have to decide at the moment, based on what’s going on – there really are too many variables to say for sure. But in general, hunkering down or sheltering in place is almost always a death sentence. I really hate when businesses or schools suggest that sheltering in place is an actual strategy for survival; it’s not! Your number one priority is to get as far away from the danger as possible. If they decide to fight back, how do they identify their opportunity to strike? Your best chance might be during a temporary pause, or when the gunman is reloading. It’s really going to depend on the situation, and you may never have a good window of opportunity. That means if you have no possible route of escape, you need to act. That is your window. How would you convince random strangers in the same area as you to rush an attacker? It’s probably not going to happen; most people panic in this type of situation because they never prepared for the possibility. The best you can hope for is yelling “GET HIM!! !” or something like that and hoping others instinctively follow. What if there is more than one shooter? What should I do differently? More than one shooter definitely changes the equation, but again these things happen so fast that you really aren’t going to have the opportunity to change things up. You will have to be more aware of where the shooters are, but in general your options are about the same; escape if you can, fight back if you have no other options. If you had to hunker down how would you signal the outside world for help? If you can quickly dial 911, without taking your eyes off the danger, then yes. And remember, when hunkering down there’s a difference between cover and concealment. You need to take cover behind something that’s actually going to stop a bullet. Real life is not like the movies, and things like chairs, cars, etc. are not going to stop a bullet. What should you teach kids to do if there is a shooting at their school? I would tell them the same things as I would an adult; your best chance is to escape. I don’t care what policy the school has in place, if they tell your kids to shelter in place inside a classroom they are wrong, and I would have some serious doubts about sending my kid to that school. Make sure your child knows where the escape routes are, and if possible download a map of the school and show them where to go. Robert’s article Protecting Your Children from Active Shooters & Mass Shootings covers this topic in detail. How do we increase our level of Situational Awareness to be able to detect danger? Part of it is just starting to make a conscious effort to look at your surroundings on a daily basis. Take note of the types of people that are around you, what they are wearing, what your environment normally looks like, etc… that way if something odd happens you will instantly recognize that things aren’t right. And don’t be afraid to trust your gut, we have these feelings for a reason. If you have kids, point things out to them when you’re out in public. Teach them what to watch out for, where exits are when you enter a business, and encourage them to look around at the world. Make them put down the electronic devices! If your face is staring at your phone you’ll never see anything! What are some areas/events to avoid if you want to minimize your chances of being a victim of a mass shooting? Avoid opening night events or premiers. Avoid politically charged rallies or anything that has a planned protest around it. What big mistakes are we told to do by the media and authorities if we are faced with this type of situation? The biggest mistakes, or downright lies and misinformation spread by the media, include telling people to shelter in place, and not mentioning the importance of carrying your own firearm protection. The simple fact is, these shooters want easy victims, and there is no way the police are going to be able to respond in time to save you. You can be a sitting duck, or you can even the playing field and give yourself a fighting chance. Do you have any suggestions for how to survive an Active Shooter scenario? What would you do if you were caught in the crossfire? Let us know in the Comments Section below, thanks! Robert Richardson is the Author of the Book: The Ultimate Situational Survival Guide: Self-Reliance Strategies for a Dangerous World. You can check it out on Amazon HERE. Get more great survival strategies from Robert here. 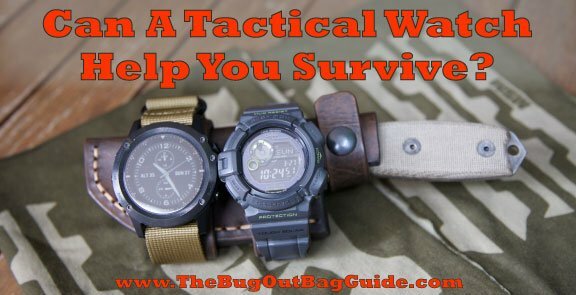 Are Tactical Watches Useful For Urban And Wilderness Survival? Survival situations can arise in the blink of an eye, so we are always looking for ways to increase preparedness. However, carrying all of your survival gear on a daily basis simply is not practical for most people. Therefore, we also try to find lightweight gear with multiple functions that can be carried discretely as you go about your day. With so many features available, tactical watches are a survival tool worth investigating. The tactical watch is possibly the most impressive form of wearable technology. With many practical uses, as well as specialized functions for extreme operations, tactical watches can provide you with a wealth of information to aid you in survival. The key to making the best choice is to determine how you are most likely to use it and finding the features that best meet those needs. Sure, a tactical watch sounds like an awesome piece of must-have gear but choosing one will be based on exactly what you will be doing. Completing a threat assessment will help you decide which features will most benefit you, then you can look for the watch with the best design for those features. No matter how you plan to use your watch, a secure comfortable fit and ease of use will play an important role. In a world where we rarely use phones to talk, it isn’t too far-fetched that the primary function of a watch is the one least considered. How the time is displayed is a matter of personal preference. Digital or analog, military or standard 12 hour, or any combination may be available, depending on the specific tactical watch. In addition to simply displaying the time, there are useful features that come into play in a post-disaster situation, such as a full calendar and sunrise/sunset indicator. Having a sense of how much time has passed when bugging out will provide a sense of stability and continuity. You can be sure the water boiled for a full 10 minutes, plan when to check your traps, or figure out how far your bug out party can travel during daylight. It is especially useful to know the exact date if you are tuning into emergency broadcasts for instruction, such as when and where relief efforts will commence. Tactical watches are built tough to withstand rigorous activity and a variety of conditions. Some have extra features to deal with special situations, such as diving, parachuting, and high impact activities. The face will typically be made of a scratch- and shatter-resistant material, such as sapphire or mineral crystal. Stainless steel is a common material for the bevel and casing, due to its durability. Anodized aluminum is a lightweight alternative that does not compromise strength. Tactical watch bands come in a variety of styles of materials, including nylon, rubber, leather, and steel. There are advantages to each material, depending on intended use and personal comfort. Other areas to consider that are specific to your needs are low-temperature resistance, submersion, impact resistance, and dust resistance. You’ll want to make sure that the construction is solid and will keep out anything that could damage the internal mechanisms. Navigation features range in accuracy and capability. For simple orientation, you might get by with compass points on a rotating ring to give you a general idea of the direction you are heading. Some tactical watches have an actual button compass integrated into the watchband, while others use a digital or analog compass display. Altimeters are usually displayed as a real-time reading but some tactical watches are able to record elevation data. Tracking your elevation is very useful in conjunction with topographical maps, making it easier to know if you are on the correct trail. For more precise navigation, you can choose a watch with a digital GPS readout so you are able to pinpoint exactly where you are. This can be very useful if you need to share or record your specific location coordinates, such as for search and rescue, locating your bug out camp, or coordinating a gathering point for your bug out party. For day to day use, approximate location may be sufficient but if you spend a lot of time in remote areas, you may want to go with a tactical watch that has GPS. For daily use, a heart rate monitor can be used to track your activity. This is a great feature for fitness training but it also has survival applications. Unless you pack a stethoscope into your bug out bag, a heart rate monitor is the next best thing when you or a member of your bug out party is sick or severely injured. For conditions such as disease, loss of blood, and shock, keeping track of the person’s heart rate and being alerted to accelerations or decelerations can be life-saving. If you are a traversing high-altitude region, an altimeter will also help with health maintenance. Altitude sickness can occur at 8000 feet above sea level and if left untreated, can result in death. The first warning signs are headache, nausea, and fatigue and should not be ignored. Breathlessness, caused by fluid in the lungs, is a sign of High Altitude Pulmonary Oedema (HAPE) and can be accompanied by fever and a frothy cough. Drowsiness, clumsiness, and irritability are signs of fluid on the brain, known as High Altitude Cerebral Oedema (HACE). Both of these conditions are fatal. Therefore, paying close attention to your altitude is especially important to your survival. A thermometer can assist you in making sure that your shelter is warm enough, knowing when to avoid being exposed to extremely low temperatures, or conversely, extremely high temperatures. The general safe temperature range for humans is 40F-95F. Spending prolonged time on the low end of that can result in hypothermia or on the high end of the range, hyperthermia. Being aware of the temperature will help you make decisions that favor your survival. Click the image to view the Garmin Tactix Bravo on Amazon. This watch is built tough for handling rigorous field operations. A high-strength domed sapphire lens is mounted in a stainless steel bezel and rear case plate. The buttons are knurled for ease of grip and are also PVD-coated stainless steel. The display is non-reflective and night-vision compatible. Two interchangeable nylon straps are included. The high-resolution display turns the watch face from an analog clock to a personal GPS device, with TracBack technology for finding your way back to your starting point. You can view your precise coordinates or switch to map view and follow your progress point to point. Mark locations along the way, such as water sources or dangerous terrain, and share them using Bluetooth or ANT+ wireless connections. The Garmin Tactix Bravo also has great features for training purposes, such as monitoring stride length, cadence, ground contact time, and vertical oscillation. The heart rate metrics provide a stress score, performance condition, and lactate threshold readout so you can track how your body is handling physical activity. It also tracks sleep patterns to create a record of your overall health. One of the coolest features of the Tactix Bravo is the ability to download additional screens to customize to your specific needs. You can even set it up to receive alerts from another device, such as emails and texts from your smartphone. The battery life depends on which mode you are using: 20 hours in GPS mode or 50 hours in UltraTrac mode. A USB charger is included. Click the image to view the Casio G-Shock Mudman on Amazon. Named for its resilience to mud and debris, the G-Shock Mudman has internal gaskets on all of the buttons and screws that are designed to handle dirty work. A sapphire crystal face protects the digital display, which features 12 or 24 hour time, date, temperature, pressure, and directional readouts. It also tracks the phases of the moon in a visual graphic. The Mudman is shock resistant and water resistant to a depth of 200 meters, making it a suitable diving companion, as well. For navigating on land, use the digital compass with full 0-359 degree range, corrected for magnetic declination. Since it is solar-powered, the G-Shock Mudman does not need to be charged or wound and it can last up to 8 months on a full charge even without exposure to light. This is a great feature for backcountry survival. Click the image to view the Timex Tide-Temp-Compass on Amazon. With several key nautical features, the Timex Tide-Temp-Compass is ideal for boating, swimming, and snorkeling. Behind the mineral glass lens is a quartz analog clock with concentric rings that include analog tide tracker and temperature displays. The digital thermometer reads air or water temperature, and the watch is water resistant to 100 meters. An Indiglo light allows you to view the full face in low lighting. The stainless steel case has a slide-rule bevel with directional indicators. A fourth hand on the clock serves as an analog display for the digital compass. The sturdy stainless steel band features a deployment clasp for a secure fit. Overall, this is a rugged watch by a trusted brand, and more economical than others in its class. Tactical watches are far sturdier than other electronic devices, such as cell phones and tablets. If you rely heavily on your smartphone to provide tactical information, keep in mind that it may cease to function in a disaster scenario and it likely wouldn’t survive 100 meter submersion, even in the toughest protective case. The convenience of having a wealth of information at your wrist and the extreme durability of tactical watches makes them a useful tool for survival situations. Which features do you think you would be most likely to use in a survival situation? Do you think tactical watches can replace other survival gear? Share your opinions in the Comments section below, thanks! It’s the quintessential moment in any horror flick – the part where the heroine is trying to sneak silently away from the bad guy by moving stealthily through the old, rickety house (aren’t they always set in an old, rickety house? ), but try as she might to move quietly, her position is given away by a loud creak from the old wooden staircase. We all wonder, why doesn’t she know how to move silently? Makes for great suspense, but in the real world, learning how to walk silently is a valuable skill that should be in every prepper’s survival arsenal. Moving in silence is not only a valuable skill, but also easy to learn and practice. Think about your safety in a SHTF situation – how beneficial would it be to be able to move or run in silence? Knowing how to walk quietly on a creaky floor or staircase gives you the advantage of stealth. There are many instances you may run into where such a skill could save your life, including sneaking past checkpoints or aggressive / hostile people, scavenging while other (potentially hostile) people are around, leaving an area when unfriendly people arrive, or successfully stalking prey while hunting. The slightest sound can alert your prey and ruin an opportunity to secure a meal. Learning to use stealth techniques is an invaluable survival skill that you and any member of your family can learn – plus it’s easy to practice! In this article, we will teach you 5 essential tricks for moving in silence – as well as 1 bonus trick! – that will allow you to move undetected and help keep you safe. If you are carrying anything, especially a backpack, stash it if you can as it throws off your center of balance. Look for somewhere safe you can leave it where it will be recoverable later. While a well-fitted backpack will be cinched tight to your body and have good weight distribution, it’s a surety that the added 30-50 lbs you are carrying around will change your center of balance. The reason this is important is that it is far easier to sneak around quietly with your natural movements and center of gravity as opposed to your body trying to compensate for the unexpected extra weight. Moving in silence is more difficult with the added bulk of a backpack because it throws off your natural balance. Image credit Joseph on flickr. When trying to move silently, if you have anything on you that jingles or jangles – get rid of it. If you are carrying items such as keys, change, jewelry, gear, buckles, or straps hanging off your body or bag that have the potential to make noise, make sure to eliminate them from your person. Bring only what is necessary for the mission and be sure to secure any gear so that it will not make a sound when you move. Also be aware of the clothing you are wearing. Some clothing may have the potential to swish or get caught on things, especially loose cargo pockets, which can easily get caught on a corner or exposed nail. Silent clothes are slim-fitting with minimal protrusions. This large hooded jacket may keep you warm but it would make it difficult to walk quietly. When moving in silence, always scope out your path ahead of time, don’t stumble along blindly. Before moving, make sure to take a few seconds to survey the area around you and scope out the best path to take. You’ll likely need to employ some improvisation at some point, but having a general plan of where you are going, including things to avoid and knowing where safe / quiet areas are, can mean the difference between detection and moving stealthily to safety. If you have a long way to go, plan your trek by stopping in safe or concealed areas and then scoping out the next leg of your trip from there. By landmines, we mean surprise objects that can give away your presence if stepped on. Items to be on the lookout for include broken glass, dry leaves, twigs, and animals. Learn how to walk silently by avoiding noisy objects, such as pine cones and twigs. When scoping out your path, try and find the way that has the least amount of debris that could potentially make noise and give you away. As you’ve no doubt seen in the movies, something as simple as the snap of a twig can immediately alert others to your presence. Additionally, look out for animals and avoid them at all costs. The bark of a startled dog or the rustle of a bird hastily flying away are key indicators to others of your location. Startling a flock of birds into flight is a dead giveaway of your presence. Even weight distribution and foot placement are key to moving stealthily and keeping your footfalls as quiet as possible. Always move carefully and with intent. While the preceding 5 tricks will help you to move quietly and undetected, there is always the chance that something will go wrong, which brings us to our bonus trick – always have an escape plan. If you are detected and need to run, it’s imperative you know which way to head in order to flee safely. Sometimes it can be as simple as going back the way you came, but in case that path is blocked or otherwise inaccessible it’s always prudent to have at least one additional escape route. If escape is not a viable option, you may want to have some means of defending yourself against whomever detected you. This could include non-lethal options such as a flashlight or pepper spray, or entail more serious options such as a survival weapon or firearm. Use a red flashlight to move at night as this will preserve your night vision and attract less attention EC11 and EA21 from Nitecore both come with a secondary red LED in addition to their main light for just this purpose. Be aware that floorboards will make more noise in the summer than in cold weather. 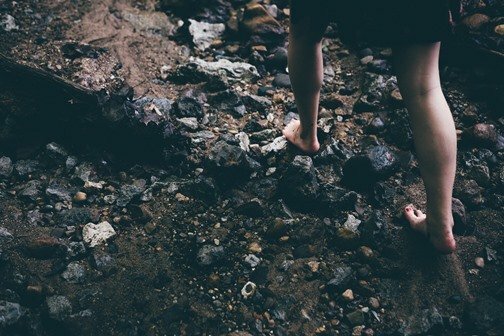 While you may be able to walk lightly over these rocks barefoot, running could cause serious injury to your feet. While at work, try walking into your co-workers’ cubicles / offices / workspaces without them noticing your presence, at least until you say “Hello,” – no need to creep anyone out! Proceed with caution and have an escape plan! What are you waiting for? Start practicing now and pretty soon you’ll be able to move around your friends and family as stealthily and silently as a cat! Can you think of other situations where it is important to know how to move silently? Have you practiced stealth techniques on your own or with your family? Tell us about your experience in the Comments section below, thanks! The gray man theory as a way of disappearing into the crowd so you can move unnoticed when disaster strikes. The idea is that you can conceal your preparedness by blending in with the crowd before or during an emergency. While it is generally referred to as the ‘gray man theory,’ this theory can of course be applied to anyone, man or woman, of any age, who needs to blend into a crowd amidst a disastrous situation to conceal the fact that they have survival skills and/or are carrying tactical gear. When you think of ‘blending in with the crowd’ it’s generally a negative, right? Nobody wants to be just like everyone else, you want to be unique, to stand out – that is, until there’s an emergency and you’re the only one prepared. As a prudent prepper, you’ll be ready when disaster strikes but what will everyone around you be doing? In states of panic, people become desperate, and desperation can lead people to do whatever it takes to stay alive – at this point, you certainly don’t want to be singled out as the one person who is prepared for survival. Disappearing into a crowd is an extremely useful survival skill. Why Use the Gray Man Theory? There are lots of advantages to blending in with the crowd when disaster strikes. For starters, by not drawing attention to yourself, you’ll be able to move more quickly and easily through the crowd without alerting others to the fact that you are prepared to handle the situation. Also, by blending in and appearing to be among the unprepared, you are less likely to make yourself a target of those in desperation who may try and take your survival gear off you by force. The gray man theory is really about protecting yourself and your family by concealing the fact that you are indeed prepared to survive in the face of disaster. The gray man theory allows you to use the herd to your advantage. In a true disaster situation, your primary objective will be to move yourself and your loved ones as quickly as possible to a safe place – be that your home or bug-out location. In a disaster, everyone around you will have the same goal – get somewhere safe – but the majority will not have a sound plan in place, leading to frantic behavior and desperate attempts for survival. In this situation, disappearing into the crowd and not drawing attention to yourself or your state of preparedness can greatly increase your chances of survival. How many of these people look prepared to handle a crisis situation? As most around you will be unprepared for disaster, you will no doubt feel the urge to help those in need. However, your number one priority needs to be your own survival and you should only help others if you can do so without endangering yourself. By blending in, or becoming a gray man, you will be less likely to be approached by others seeking assistance and, more importantly, less likely to be targeted by opportunists looking to prey on those with the forethought to pack essential items for survival situations. The best way to not leave a lasting impression is to not leave any impression at all. This is the concept behind the gray man theory and it sounds simple enough, but execution can be challenging. In this guide we will cover the basic concept behind the gray man theory and provide some key tips and tricks for effectively making yourself ‘invisible’ in a disaster scenario. The ultimate goal of becoming a gray man or woman is to camouflage yourself into appearing as though you are just part of the crowd so as not to allow others to identify you as a potential gold mine of supplies or information. By exuding confidence and preparedness, you will draw in opportunists who will attempt to capitalize on your resourcefulness to the detriment of your own survival. To conceal the fact that you are prepared with survival gear and skills from others, there are four key areas you will want to focus on: how you act, how you move, how you look, and how you carry your gear. The key to acting like a gray man is to appear average and non-threatening. Be careful about what you say and to whom you say it – being known as strongly antagonistic or too outspoken about your political beliefs can lead others to make assumptions about you and mark you as a prepared individual. Maintain conversation topics within the norm of the group. If small talk seems to be the normal thing to do, engage with others so as not to draw attention to yourself. While a good understanding of your surroundings is paramount in a disaster, be careful to play down any attempts to scan areas for escape routes or possible problems with security. This type of behavior will be noticed and lead people to question what it is you’re looking for, or worse, what it is you’re trying to protect. The gray man theory relies on not leaving an impression. Eye contact stimulates the brain to form a memory so keeping your eyes averted can help you remain unnoticed. One important skill to learn in adapting a gray man persona is how to maintain your privacy without appearing overly private or obviously standoffish. When speaking with others, keep eye contact to a minimum as someone is more likely to notice you if they look in your eyes. Even brief eye contact when passing on the street can form a connection, making you more memorable than those around you. Knowing the local landscape can be a tremendous advantage as the better you know local streets and landmarks, the better able you will be to navigate them and alter your route to avoid troublesome areas. When moving, appear as much as possible to go with the flow, walking with purpose but not urgency. Any rapid motion will draw attention to you and raise suspicions as to your motives. An integral part of the gray man theory is the ability to move through a crowd without drawing attention to yourself. When navigating a crowd, make gradual progress – cutting through a sea of people at sharp angles will draw attention to your movements and make you appear suspicious. Whether you are perceived by others as a savior or threat, either one can slow you down. Unless it would impede your own safety, always appear to follow the herd. For instance, if everyone around you turns towards an explosive sound and gasps, join them. You don’t ever want to be the one person who is unaffected by an out-of-the-ordinary event. Follow the focus of the crowd – notice the woman standing with her back turned? According to the gray man theory, in a SHTF scenario, this behavior could raise suspicion. Photo via Intel Free Press on flickr. If you need to break away from the crowd, try and make your exit alongside a small group of people, keeping enough distance so that they know you’re not with them but close enough that you don’t appear to be alone, which makes you appear less vulnerable. When observing your surroundings, be as discreet as possible. Leverage your peripheral vision as well as decoy objects, such as a piece of paper, to give the impression your attention is focused on the object as you survey the area. If appropriate, wear reflective sunglasses that hide your eyes allowing you the freedom to scan rapidly without drawing attention. Sunglasses on a sunny day are a good choice for obscuring your face. At night, they would have the opposite effect, drawing attention as something out of the norm. If you need to engage in activities that will make noise and draw attention your way, try to take advantage of predictable noises to help mask the sound of any breaching you may need to do. Predictable noises include ‘white’ noises that people are accustomed to hearing and therefore raise little suspicion. You can take advantage of distractions to make small moves toward your destination. For instance, wait for a loud bus to pass before climbing into a dumpster or synchronize busting a window with a loud siren. If you need to get into a building, choose a door near a noisy HVAC condenser. These preparations may take a little bit of extra time to execute, but those few moments of patience will ensure your activities go unnoticed and may just save your life. It goes without saying that when trying to appear less prepared than you are, camo prints or other outwardly tactical-looking clothing are not the best choice, unless of course you are in a situation where that type of dress is the norm, such as a hunting trip. While you don’t have to dress head-to-toe in gray, subtle color choices blend best into crowds and make it easier for you to move unnoticed. Which is the first person that you notice? Bright colors are easy to track through a crowd. Ideally, you will want to keep any tactical gear concealed. This means packing your pockets and bags strategically to allow for quick access to key items. Reflective objects and bright colors will draw visual attention so ensure items such as your knife are tucked inside your clothing or bag, not hanging from your belt. Avoid having any reflective materials or highly visible colors on your clothing and accessories, as well as any large text or memorable insignia. Any focal points can draw attention to you and hinder your attempts to blend in. Even if this officer were in civilian clothing, the shiny handcuffs and holster would be highly visible and leave an impression on passersby. If possible, carry an additional item with you that can change your look instantly, such as a hat, sunglasses, or jacket, as this can be quite helpful. If someone does happen to peg you as a target, you can use the item to slip under their radar as they scan for you in a crowd. One last word of caution – be mindful of the way you smell. Yes, smell. Believe it or not, scent is a major memory trigger, so when trying to blend in, try not to have a noticeable scent about you. The simplest solution to carrying your gear unnoticed is to find a discreet every day carry bag that blends well with your typical daily routine. Backpacks and messenger bags commonly seen on commuters are good choices as these tend to be less obvious. You can also find pocketbooks with compartmentalized interiors that can make it quick and easy to access your gear. There are many options for a tactical bag with a low profile that can fit into your typical style without drawing attention. Another good choice that lends itself well to blending is a jacket or vest with a streetwear outward appearance but hidden storage on the inside. Pants with pockets, especially cargo pants, are excellent for storing gear but may not be the most appropriate choice for some people such as people that work in an office with a formal dress code. The gear you carry with you on a daily basis should also be discreet if you want to be a gray man. For example, for self-defense you may opt for a tactical pen or a discreet folding knife such as the Boker Subcom folding knife which can even double as a money clip. 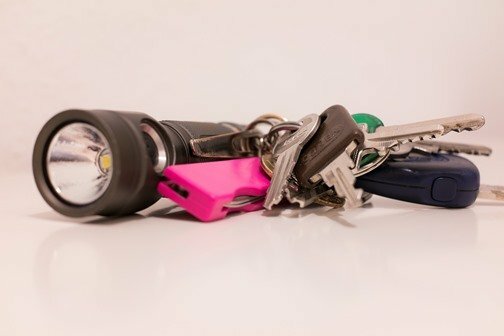 A compact flashlight such as the Fenix E05 is so compact it can easily be carried on a keychain without attracting. In the immediate aftermath of a disaster or in a post-apocalyptic scenario, the ability to conceal yourself as a gray man can be an extremely useful survival skill. The last thing you want is for all your time and effort put into prepping to be for naught by having your supplies taken off you by someone less prepared and more desperate. To improve your gray man abilities, observe the way people dress and act as you go about your day – what stands out, what makes various people noticeable? This can help you hone in on the objects and behaviors that draw attention. Combining this knowledge with the four key steps to becoming a gray man will put you well on your way to being able to ‘disappear’ into any crowd and increase your chances of survival when disaster strikes. Do you have any thoughts on the gray man theory? Have you experienced a situation where you needed to conceal your preparedness? Let us know about your thoughts and experiences in the Comments, thanks! Note: This article was contributed by Cory from survivethewild.net. Being a prepper has many great benefits, you have abundant food storage and supplies, you have a bug out bag ready for any situation and you have knowledge that could mean life and death when the SHTF. But all of these things could make you a target to those close to you who see the abundance of supplies and knowledge you have. So we’re going to go over the threats that are likely present to your survival preps right now, whether you live in the suburbs of Los Angeles or the rural dirt roads of Killeen, TX. There’s always someone that wants what you have, and are willing to do whatever it takes to get it. Also we will take a glimpse into the future of the dangers that could be avoided. No one knows for certain how life will be once the SHTF, but we can make accurate assumptions based on what we know now. While this may not be a big concern if you live out in the sticks, if you live in the city you’ll have people within arms distance no matter where you turn. Which means that eyes will be on you and what you’re doing, whether with intent to get what you have or just out of curiosity. Neighbors aren’t in themselves a bad thing, community is what we all desire and if you have the right community then great. Just know that if you let your community become aware of your survival preps, then you have put yourself on their list of “resources”, and they’ll likely come knocking your door down when it all goes down. You’ve worked hard to build up survival preps for your family. Be cautious of letting others know about your preparedness efforts. Image via Bob on flickr. Living in close proximity can make it even more difficult to keep your survival preps on the down low, but your neighbors can also be your allies if you play your cards right. It’s true that there’s safety in isolation, but that goes for the perpetrator as well. If you do live in the rural areas then you will need to be on your guard more so than people living within the city. Not because there’s more people, but for the fact that there’s less people which can be witnesses. Choose your level of isolation carefully when planning your bug-out location. Think about it, if someone were to get past your defenses and use mildly silenced weapons to take you and your family down in a blaze of gun fire at night, there probably wouldn’t be anyone to stop them or witness it. Isolation may be a great defense, but it’s a double-edged sword. Establish relationships with those closest (geographically) to you and have nightly check ins. This can be an excuse to build lasting relationships to prevent cabin fever. This sounds like a pretty small factor to a prepper. I mean, you’re someone who’s got plenty of ammunition and know how to take care of a simple burglar. But as is the case in life, it’s not always that simple. There are preppers in the community who would much rather take from those who’ve spent the time storing food and make plans, rather than do it themselves. And unfortunately these people are a very real threat, mostly because you’re fighting an enemy who is reading from the same playbook as you essentially. Which means that you’ll need to get a little crafty in your defenses. Stay one step ahead by taking security measures to protect your survival cache. Image via *sax on flickr. Maintain a constant state of awareness as to who’s around your property or neighborhood. Whoever seems out of the norm should be documented, and if needed, approached with caution. Don’t make your routines noticeable, this will make you an easy target because they can predict when you won’t be home and then take your stuff. Drones can be programmed to perform perimeter surveillance flights. CLICK HERE to learn more. A lone stranger can mean big trouble for your bug-out group. Now don’t expect some greased up motorcycle riding bandits that wear tire clothes and have wild hair. That would make life too easy if all the bad guys were that easy to spot. No when the grid goes down we’ll all be cautious, and the marauders often more so to hide their intentions. A marauder doesn’t always have to be someone who comes in guns blazing, a more biblical approach is what should be expected. They’ll appear weak and defenseless, left by their friends and starving alone. Then when you let your guard down they’ll take all you’ve got. Any new comers to your group should be extensively vetted for signs of untrustworthiness. It would be a good idea to have “morality tests” in place to find out the true colors of the new comer in situations where they feel no one’s watching. Let’s face it, no one will ever be the perfect leader, and there will always be someone who either thinks they can do it better or just wants the power. Either way, there are bound to be times when your leadership is questioned and the possibility of an insurrection emanates. Now this decreases a bit if you’re traveling with family. The dynamics of a household that was brought up for this exact scenario will keep their cool a lot better than a suburban family that’s had all they’ve worked so hard for stripped away in a matter of days. It’s these people that will likely turn on each other in a desperate attempt to regain some sense of getting back to what was normalcy. Life after disaster is tough enough. Preparing your family now to work as a team will contribute to your survival success. Start working with your family now to lay down the laws of how things will be, and set systems in place that provide justice within the group. As well there needs to be checks and balances, a dictatorship isn’t any fun. Make a decision that if you bring strangers into your fold that they know that it’s your way or the highway. In the absence of organized government, people will likely resort to intimidation tactics in order to gain power and improve their rank. This is a Hollywood term given to people who might build a colony or safe haven that “rescues” travelers. But instead of rescuing them, they’re relieved of their lives and supplies for the good of the colony. This idea was made popular in the tv show “The Walking Dead”. And to be honest it’s something that many have considered a negative likelihood for the post SHTF times. And you need to know how to deal with it so that you can properly take care of your family. Avoid going into situations like these all together, true there may be some camps that are good, but you only get one chance to make the wrong mistake. If you stumble upon one of these camps take time to observe it from a distance, note if newcomers are made a part of the community or if just what they brought makes it to the community. I hope this has been a learning experience for you, and while this is a pretty heavy and somewhat depressing subject to talk about, I’m glad that you’re taking the time to learn about the dangers we’re facing now and in the future! With this knowledge I hope you use it to guard your family closely. If you liked this article, please feel free to come visit us as well over at survivethewild.net. Thank you, Chris for your generosity in letting us come and spend time with your amazing readers. Do you discuss your prepping efforts with your neighbors and friends? How do you decide who to tell about your survival preps? Share your thoughts in the Comments section below, thanks!